Crown fractures as a part of traumatic injuries are common among schoolchildren. They create serious functional, esthetic and psychological problems. The clinicians must deal with sometimes small patient’s age, need of high esthetics in the front part and the choice of exact treatment plan. Repeated reconstructions are needed in many cases because of compromised results as time passed by. Achievement of promising restoration that preserves its esthetics and strength is the greatest desire for both children and their parents. 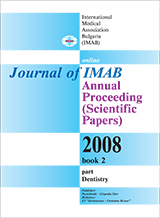 In this review are collected data for the usage of laminate veneers for restoring fractured incisors in schoolchildren. A critical analysis of proposed from different authors improvements and objections has been made. These methods summarize succession in the right therapeutic approach. Key words: veneers, crown fractures, permanent teeth. 1. Alonge OK, Nerendran S, Williamson DD. Prevalence of fractured incisor teeth among children in Harris County, Texas. Dent Traumatol 2001; 17: 218-221. 2. AlSarheed M, Bedi R, Hunt NP. Traumatized permanent teeth in 11-16-year-old Saudi Arabian children with a sensory impairment attending special schools. Dent Traumatol 2003; 19: 123-125. 3. Bruton PA, Aminian A, Wilson NH. Tooth preparation techniques for porcelain laminate veneers. Br Dent J 2000; 5: 260-262. 4. Calamia JR. Clinical evaluation of etched porcelain veneers. Am J Dent 1989; 2: 9-15. 5. Castelnuovo J, Tjan AH, Phillips K, Nicholls JI, Kois JC. Fracture load and mode of failure of ceramic veneers with different preparations. J Prosthetic Dent 2000; 83: 171-180. 7. Dhur VB, Lloyd CH. The fracture toughness of repaired composite. J Oral Rehabil 1986; 13: 413-421. 8. Dumfahrt H. Porcelaine laminate veneers. A retrospective evaluation after 1-10 years. I. Clinical Procedure. Int J Prosthodont 1999; 12: 505-513. 9. Kreulen CM, Cruegers NH, Meijering AC. Meta-analysis of anterior veneer restorations in clinical studies. J Dent 1998; 26: 345-53. 10. Larson TD. The use of a direct bonded microfilled composite resin veneer. JADA 1987; 115: 449-53. 11. Magne P, Douglas WH. Cumulative effects of successive restorative procedures on anterior crown flexure: intact versus veneered incisors. Quintessence Int 2000;31:5-18. 12. Magne P, Douglas WH. Interdental design of porcelain veneers in the presence of composite fillings: finite element analysis of composite shrinkage and thermal stresses. Int J Prosthodont. 2000; 13: 117-124. 13. Magne P, Douglas WH. Optimi­zation of resilience and stress distribution in porcelain veneers for the treatment of crown-fractured incisors. Int J Periodontics Restorative Dent. 1999; 19: 543-553. 14. Padbury Jr A, Eber R, Wang H-L. Interactions between the gingiva and the margin of restorations. J Clin Periodontal 2003; 30: 379-385. 15. Peumans M, Van Meerbeek B, Lambrechts P, Vanherle G. Porcelain veneers: a review of the literature. J Dent 2000; 189: 163-177. 16. Rochette AL. A ceramic restoration bonded by etched enamel and resin for fractured incisors. J Prosthetic Dent 1975; 33: 287-293. 17. Shaini FJ, Shortall AC, Maruis PM. Clinical performance of porcelain laminate veneers. A retrospective evaluation over a period of 6.5 years. J Oral Rehabil 1997; 24:553-559. 18. Shortall AC, Uctasli S, Maruis PM. Fracture resistance of anterior, posterior and universal light activated composite restoratives. Oper Dent 2001; 26: 87-96. 19. Troedson M, Derand T. Effect of margin design, cement polymerization, and angle of leading on stress in porcelain veneers. J Prosthet Dent 1999; 82: 518-524. 20. Walls AWG, Steele JG, Wassell. Crowns and other extra-coronal restora­tions: Porcelain laminate veneers. Br Dent J. 2002; 193:73-82. 21. Welbury RR. A clinical study of a microfilled composite resin for labial veneers. Pract Periodontics Aesthet Dent. 1996; 8:627-638.